These instructions explain how to install VNC Connect (version 6+) on supported Windows computers. VNC Connect consists of a VNC Server app for the remote computer you want to control, and a VNC Viewer app for the local device you want to control from. Separate MSI installers are available for VNC Server and VNC Viewer to facilitate remote deployment to multiple Windows computers using industry-standard tools such as Group Policy. If you are upgrading from VNC 5.x and have a valid Personal or Enterprise license key, installation should be seamless. You do not need to stop VNC Server, and any configuration changes you have made will be preserved. 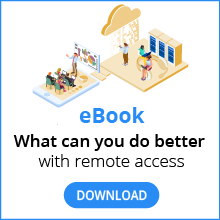 If you wish to enable cloud connectivity, perform this post-install step. If you have an out-of-date Personal or Enterprise license key for VNC 5.x, you must purchase a subscription as a new customer. If you have a Free license key for VNC 5.x, you can migrate to a new, free Home subscription providing you install VNC Server desk-side. You cannot migrate over a remote control session. If you wish to upgrade from VNC Enterprise Edition or VNC Personal Edition 4.x, we recommend you first contact Support. Download the VNC Server executable to the remote computer you want to control. Under Windows 8 or later, it is recommended you install to a secure location (for example, C:\Program Files). Double-click the executable to start the graphical Install Wizard, and follow the instructions. Open a Command Prompt. On Vista and later, perform this operation as an administrator (right-click Start > All Programs > Accessories > Command Prompt and select Run as administrator) to suppress UAC prompts. VNC Mirror Driver (gives better performance on Windows 7). To exclude, specify ADDLOCAL=FeatureServer,FeaturePrinterDriver. VNC Printer Driver (enables remote printing). To exclude, specify ADDLOCAL=FeatureServer,FeatureMirrorDriver. You must license VNC Server running on the remote computer or remote access will not be available. You don’t need to license VNC Viewer. If you have a Home or Professional subscription, follow these instructions. If you have an Enterprise subscription, follow these instructions. VNC Server starts automatically in Service Mode. To learn how to operate VNC Server at the command line, follow these instructions. Download the VNC Viewer executable to the computer you want to control if you have administrative privileges to install, or the standalone binary if not. Home or Professional subscription, you can only establish cloud connections. Enterprise subscription, you can establish cloud connections, direct connections or both. You can change or repair VNC Server or VNC Viewer using Control Panel > Programs and Features in the standard way. You can uninstall VNC Server or VNC Viewer using Control Panel > Programs and Features in the standard way. Administrative privileges are required. You may need to restart the computer.